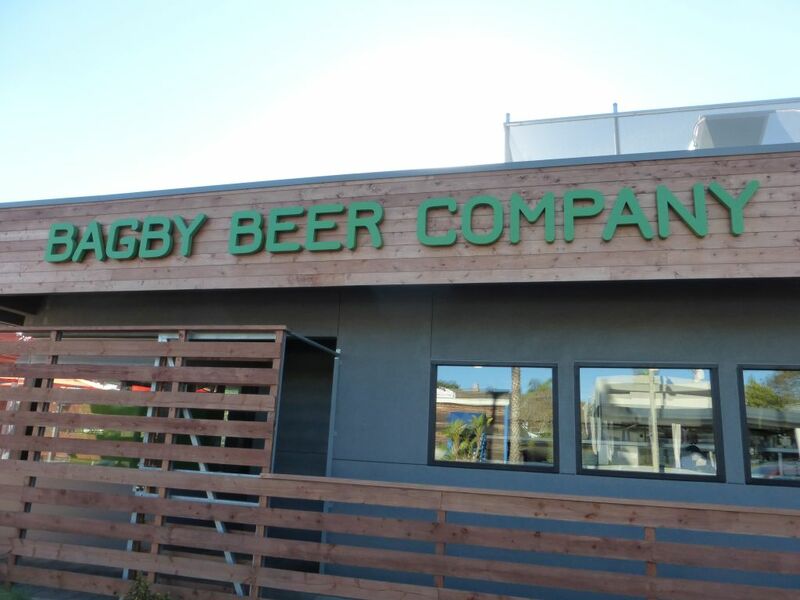 If driving to Oceanside the previous weekend to visit Bagby was far, I especially was not very excited about driving all the way to Valley Center to try a brewery. Though Oceanside is right off a major highway, Valley Center is only accessible by a few smaller roads where you aren’t going to be driving very fast. Though, after tasting some of the really tasty beers, I was glad I made the trek. 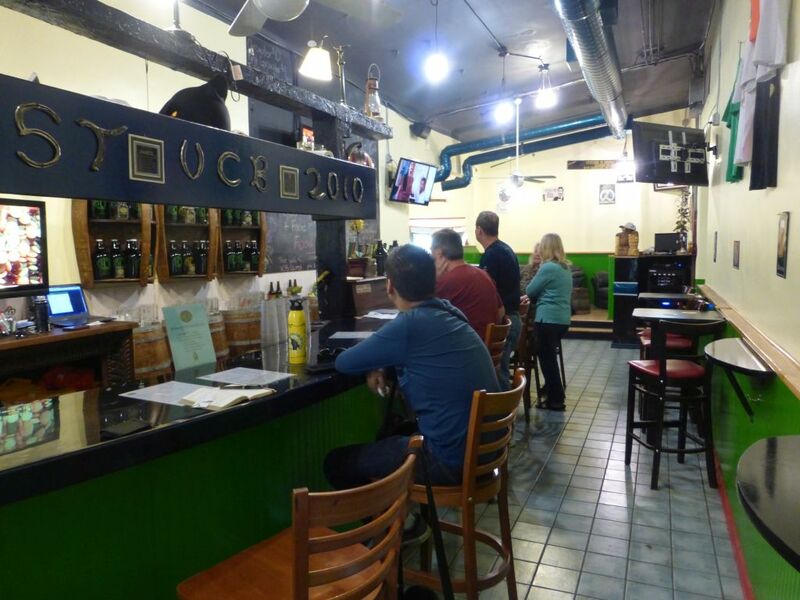 I visited Valley Center Brewing on February 1st 2015. Because I visited with a groupon, I started out with a bunch of tasters. Though I also had two full pours to look forward to, also included, since my husband, who was driving back, was only going to help me a little bit with those. I was intrigued by the selection once I noticed some styles that I don’t expect. To start with I ordered a flight of Rusty Pail Pale Ale, Farmhouse Ale, Oaked Red Ale, Hell Hole Cayon Stout, Smoked Porter, and Evening Star Barrel Aged Stout. 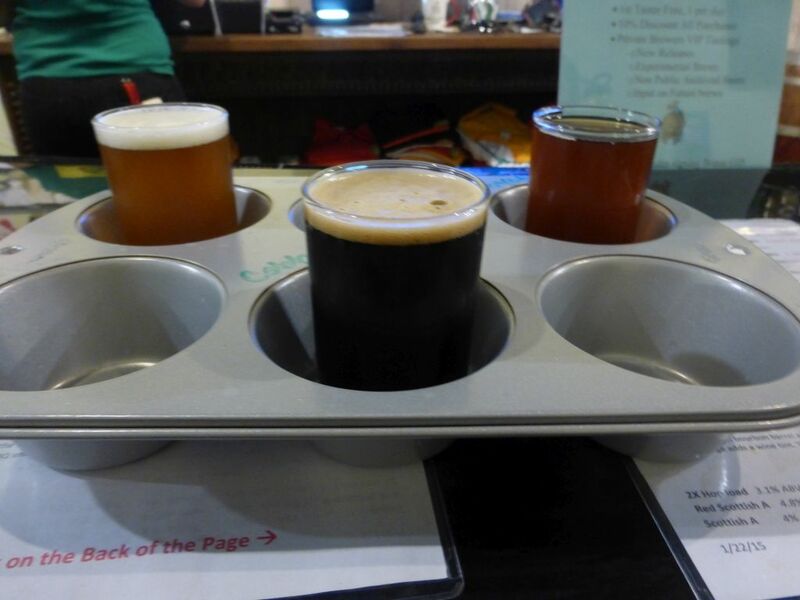 Later I also tried the Belgian IPA, the Coffee Stout, and the Coyote Run IPA. 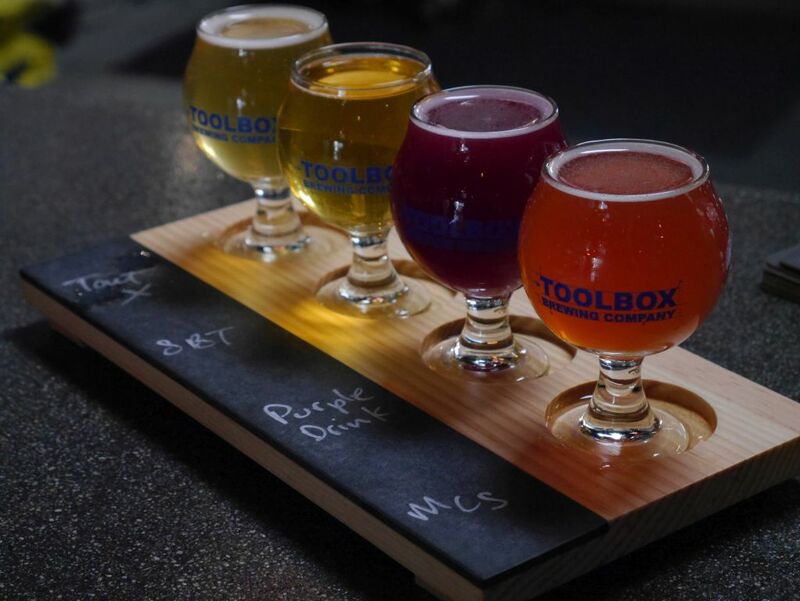 First taster flight. Note how dark the beers in the back are as well. The farmhouse ale was quite tasty, offering plenty of mild tart flavors and a little crisp fruity bite at the back end. The brewers describe this as having apple flavors. Rusty Pail pale ale was a very typical pale ale flavor like a Sierra Nevada Pale though the malts were a little less intense and didn’t overpower the hops. This one was just OK to me. The oaked red ale was the first beer I noticed that really had some different flavors at the beginning compared to the end. Later I noticed that a lot of the other beers had flavors that changed over the course of a taster sometimes very significant. At first the red ale was too smoky but when I got closer to finishing the taster I started to notice the smoke balanced much better with the rest of the beer. Next came the smoked porter. This was interesting because the bourbon flavor was much lighter than you typically see in San Diego bourbon aged beers, giving it an almost sour flavor. Combined with that was a light smoke flavor to balance it out. This is certainly not your typically roasty porter and my husband was not a fan. Then I tried the Hell Hole Canyon stout. This one was so good I had to stop my husband from drinking the whole taster before I got to try it. This was also the second of my full pours later. Flavor wise, I was quite impressed by all the different things I tasted from coffee to bitter chocolate and plenty of roasty flavors. I hope this one sticks around for quite some time. The Belgian IPA was also very tasty. At first I got a ton of spice with mild citrus hops but over time the spice seemed to mellow out, leaving me with some fantastic citrus flavors and a little bit of ripe fruit. This was later my first full pour and still very enjoyable. 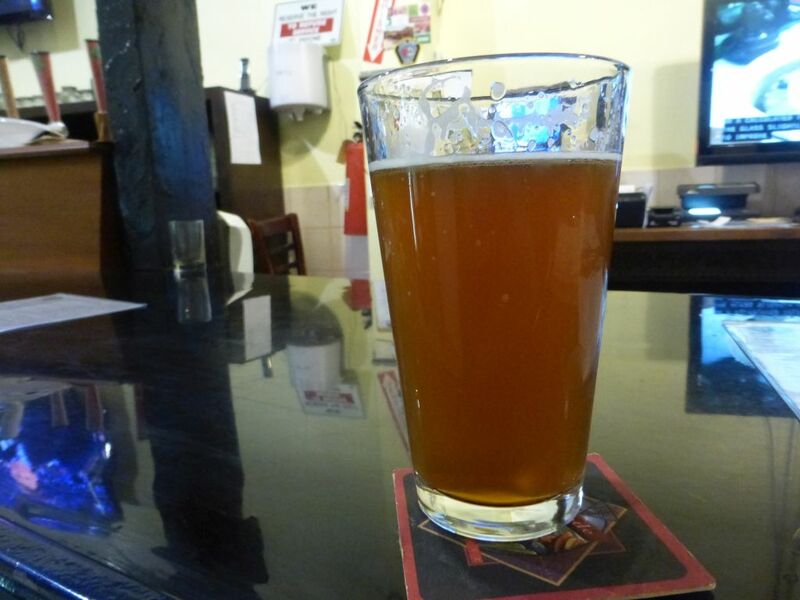 The Coyote Run IPA started out with a powerful ripe peach flavor with plenty of tart and as I progressed through the taster the malts became more prominent. Though I wasn’t immediately drawn into this beer it seemed to be quite popular among regular visitors. Sadly the other IPA they usually have was gone when I stopped by, perhaps due to popularity. Full pour of the Belgian IPA. The coffee stout, made with local roasted Sumatra beans, was a tasty coffee beer with plenty of coffee flavor at the forefront. Though to me compared to the Hell Hole Canyon it was hard to ask for more. Finally, the bourbon barrel aged stout called Evening Star, like the smoked porter had an interesting intense tart flavor that I don’t normally find in this sort of beer. This sort of tart flavor tends to come from something aged in wine barrels. When I asked the head brewer about these two tart aged stouts I was told that they used barrels that had already been previously used by another brewery, so they didn’t have the same intense flavor of bourbon that tends to come from first run use. I didn’t find either of the barrel aged beers to have the sorts of flavors that typically get me excited about bourbon aged beers so they aren’t for everyone. From what I tried, I was glad I made the drive up to Valley Center. I still can taste the delicious flavors of the Hell Hole Canyon Stout and the Belgian IPA. They also had four lighter beers that I wasn’t able to try, a Kolsch, Blonde, Cream, and Summer Ale. I’m told that these were added due to local demand and since I am not a big fan of those styles I stuck to what I enjoy. At some point I may make my way back there, possibly while I am in the area for some seasonal event, so that I can try the other IPA that was not available when I stopped by. 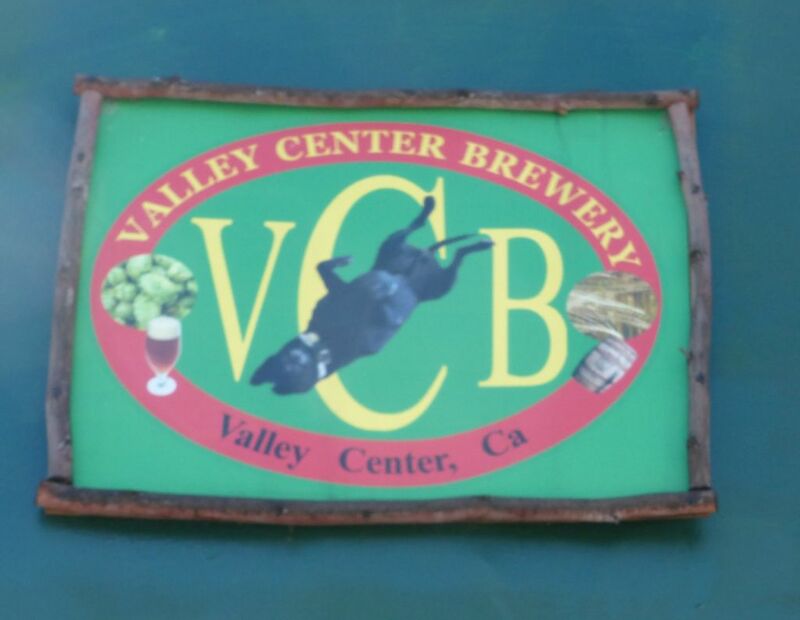 Valley Center Brewing is also interesting because they had a few experimental beers on tap to try. I didn’t end up tasting the experimental beers while I was there either, but it sounded like there were some interesting beers available on there. 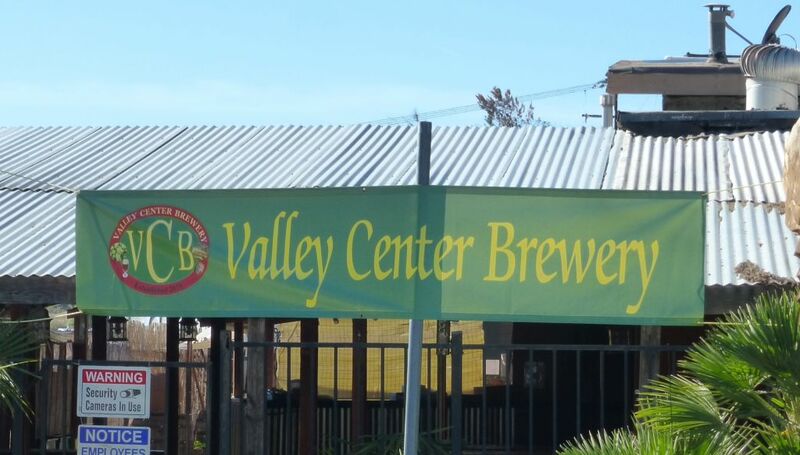 If you are in the area and want to have a beer, Valley Center Brewing offers a great lineup of interesting IPAs, Stouts, and even a solid farmhouse ale. The Belgian IPA and Hell Hole Canyon both stick out as great beers that have just the right flavors. 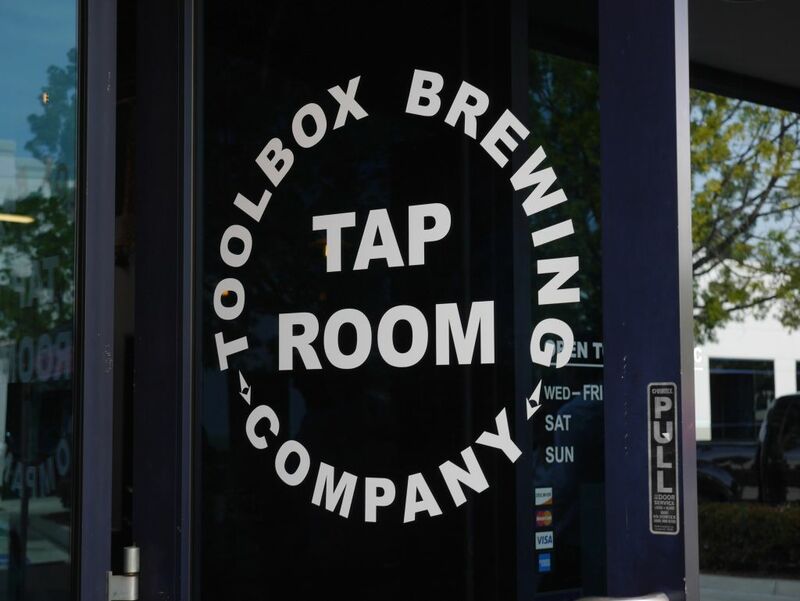 Part of what got me started with this blog is the desire to cut through the noise and let people know when a great beer shows up. Usually this is from local breweries, but occasionally something from out of town gets wider distribution and becomes available locally. 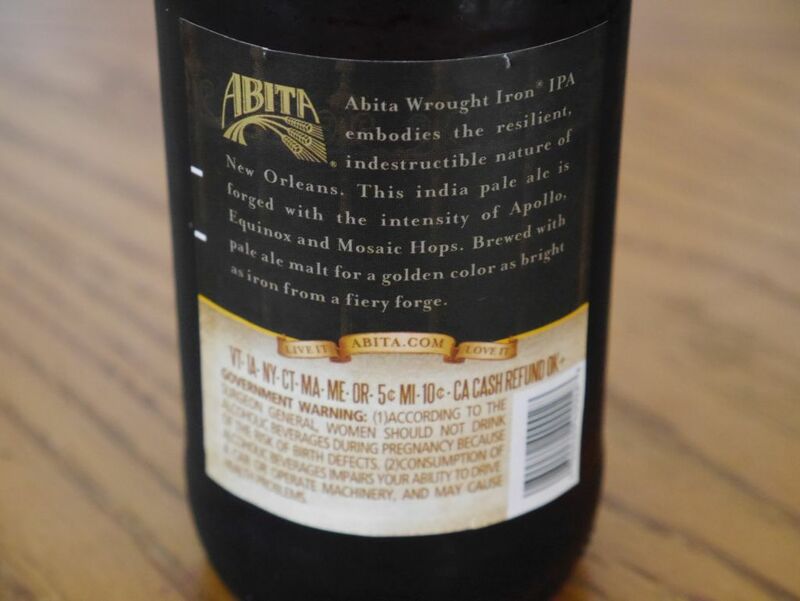 That happened to be the case with Louisiana brewery Abita that I just noticed in the local shops with an interesting IPA. What first stuck out to me was the fantastic little informational chart on the six pack itself spelling out the different types of hops, malts, yeast, and water used as well as how dark and bitter the beer is and even suggested food pairings. Based on the description I was intrigued because it seemed to be a lighter color hop-forward beer just how I like it. 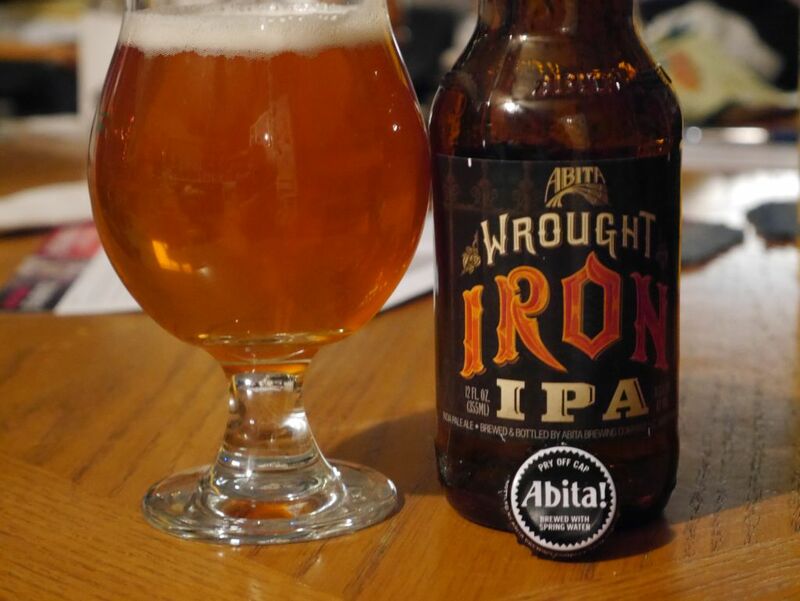 When I poured my first glass of Wrought Iron IPA I was hooked and immediately went back to where I got the six-pack to buy another one in case they ran out before I got back. Grapefruit flavors balance nicely with the malts leading to a distinctive flavor that I haven’t had elsewhere. The light grapefruit closely resembles Alpine’s Nelson. Bright general citrus flavors give a solid bitterness as well. Ever since Green Flash started having food trucks at their brewery in Mira Mesa I have been chasing the food trucks. Thanks to their schedule posted online I was able to decide when to go based on when my favorite food truck was there. Now that has all been replaced by a house food truck that will be serving food at the brewery whenever they are open. 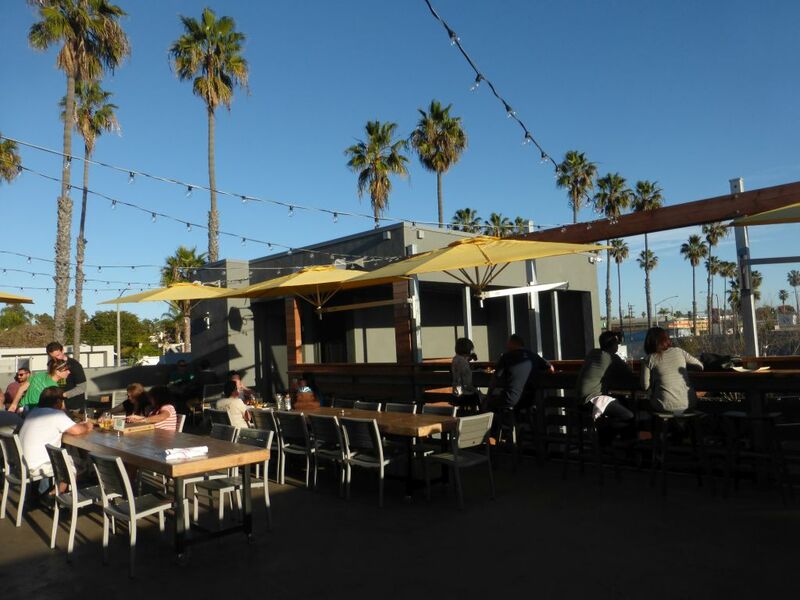 The menu can be found on the Green Flash web site where they previously listed the schedule of food trucks. Now it explains that the Green Flash Gastro Truck is here to stay and the current menu is displayed. 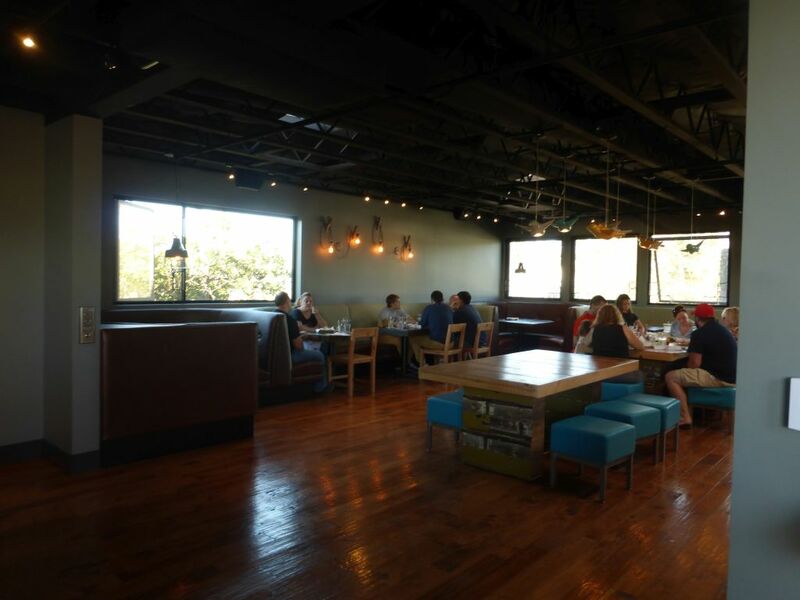 When I visited on February 11, 2015 the initial menu already presented plenty of great options. Bahn Mi with Alpine Nelson. The group I was with ordered the Pork Bahn Mi, Rocket Salad with Chicken, and Shrimp and Gritts along with a side of fries that later turned into two. Prices are in line with the food trucks I am used to seeing at Green Flash, around $10 per item with some of the starters a little less. The side of fries for $3 is large enough to share with a friend or two while you each enjoy your order. 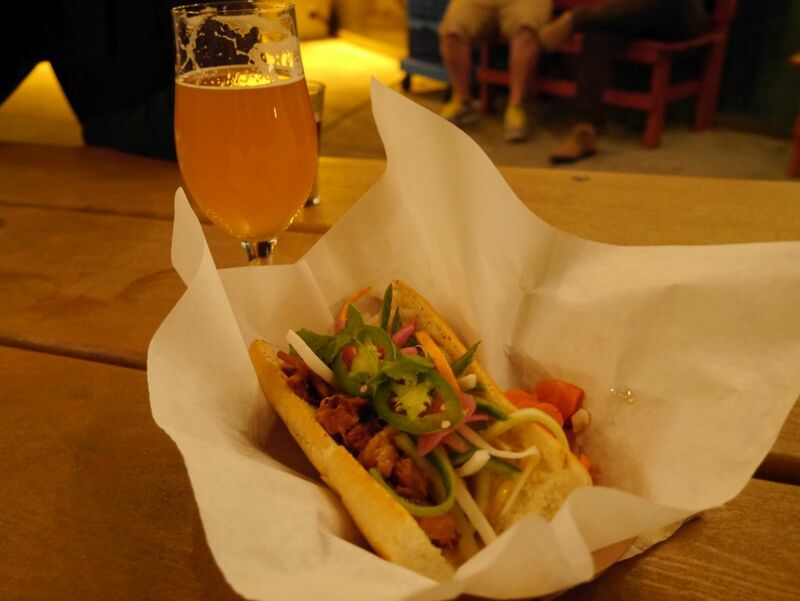 The Pork Belly Bahn Mi paired delightfully with the Alpine Nelson I had with it thanks to the recent acquisition of Alpine by Green Flash. The habanero aoli on the pork, which was flavorful and not overpowering, really responded nicely to the grapefruit flavors of the Nelson. 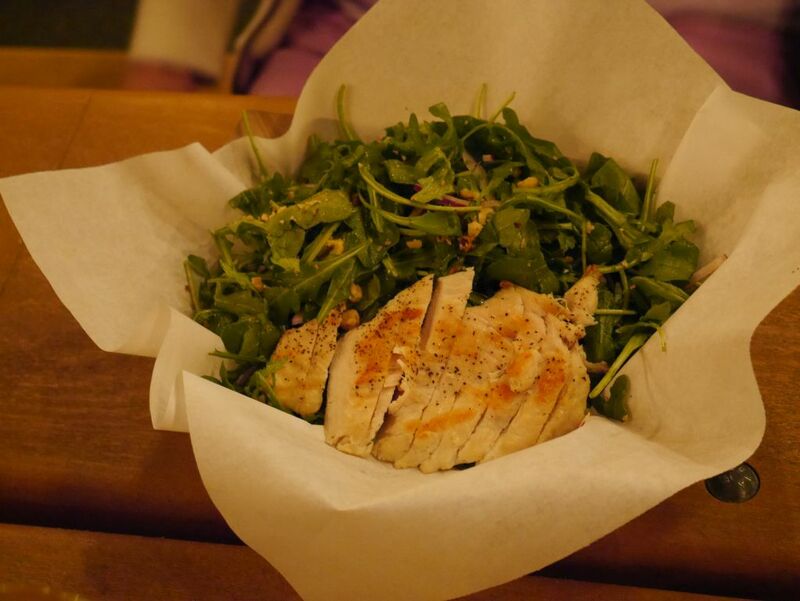 As you can see below, the Rocket Salad had a good portion of chicken. 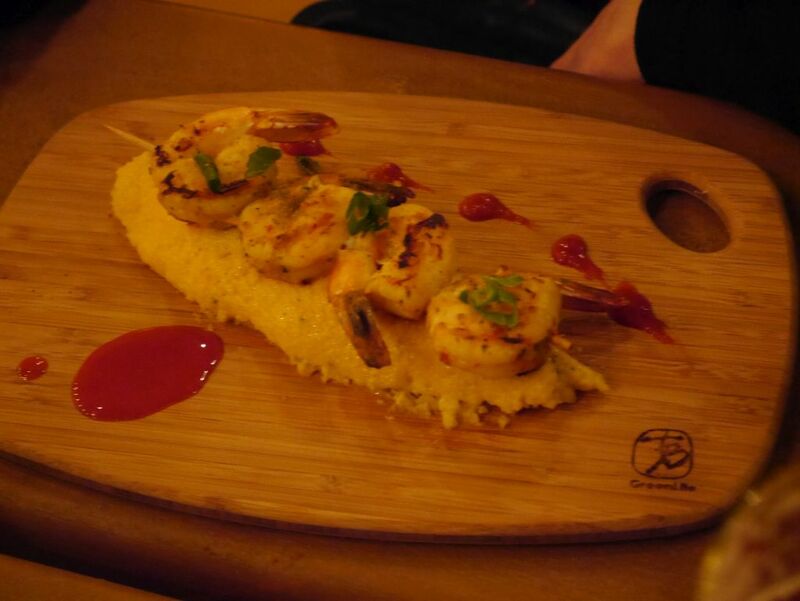 Also, my dad very much enjoyed the flavors of the shrimp and grits. 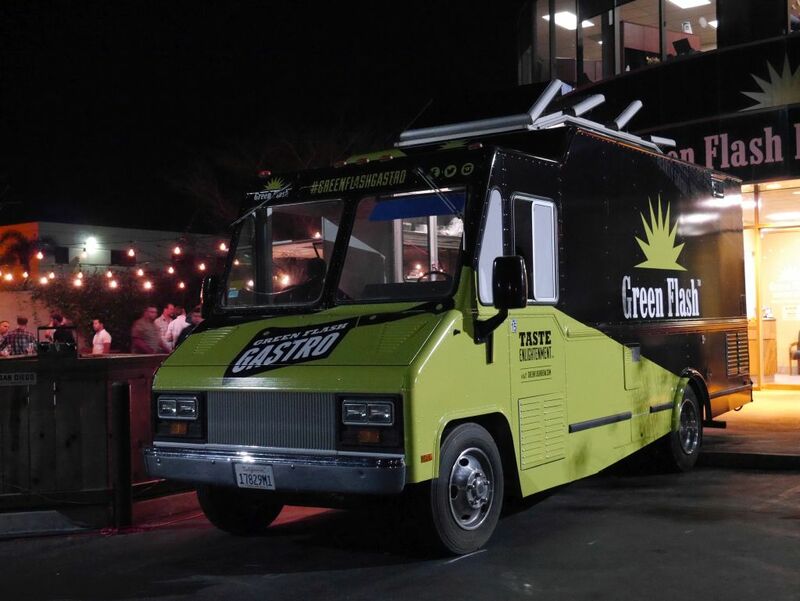 Green Flash Gastro Truck felt like a combination of some of the best culinary ideas I have experienced at visiting food trucks. 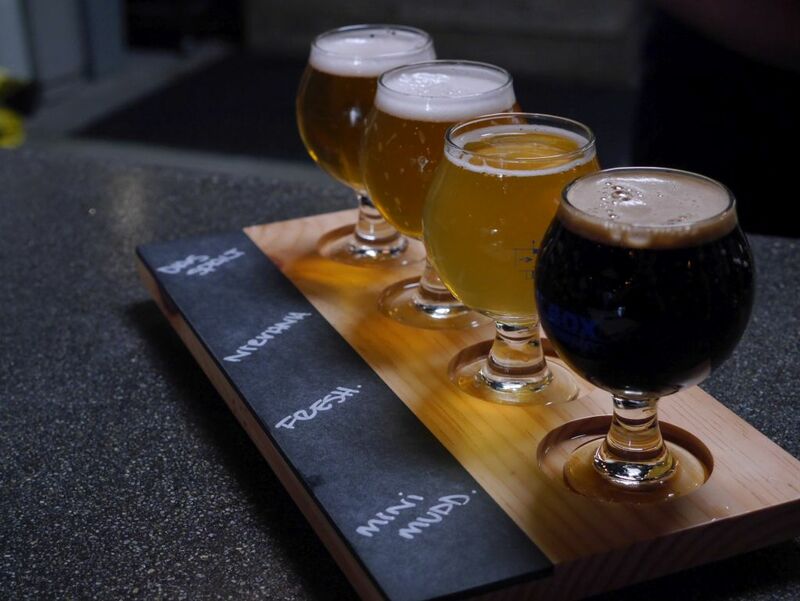 I’m looking forward to doing some beer and cheese pairings on a future visit with their cheese board. If you have enjoyed other food trucks at Green Flash in the past, this new house truck will feel right at home. 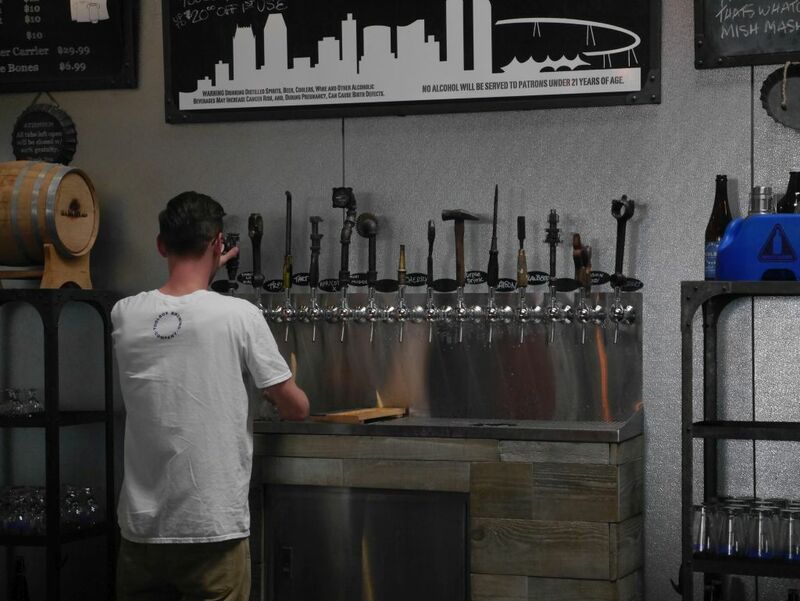 Bagby Brewing Company drew in local craft beer lovers from the very beginning thanks to head brewer Jeff Bagby’s history brewing with Pizza Port for 6 years and brewing many award winning beers. 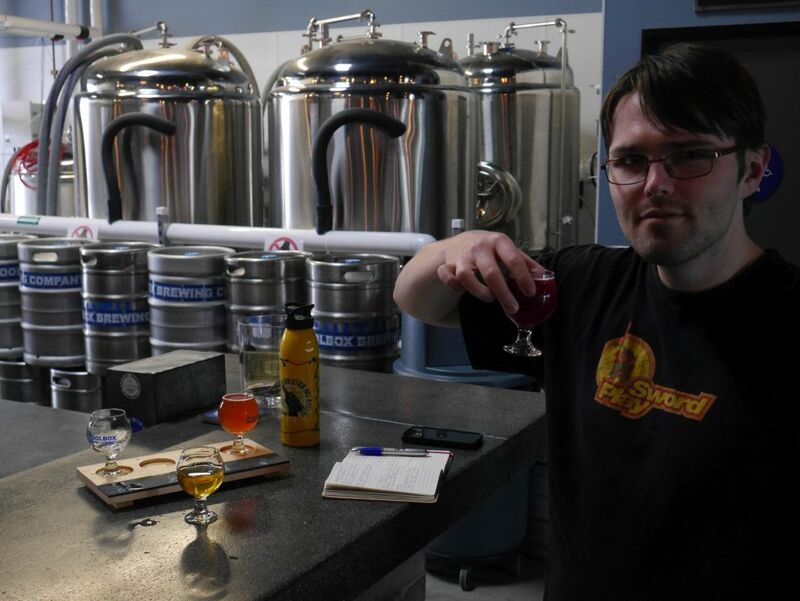 He is well known both among brewers and locals as a brewer with talent who knows what a good beer should taste like. 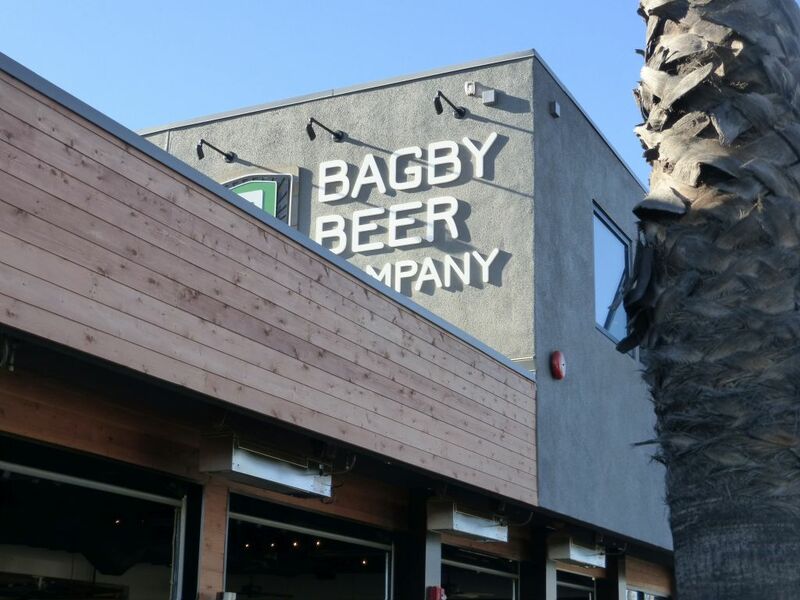 With that in mind, when I visited Bagby I had high expectations, which generally leads to disappointment but not this time. 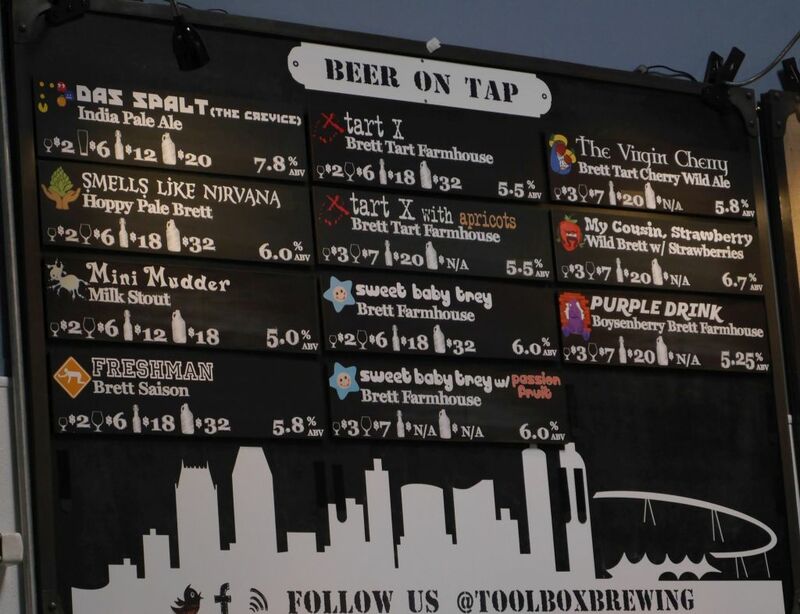 Thankfully, there were many impressive beers available such that I can say it is worth the drive up to Oceanside. All of the beers I tried packed in a lot of flavor and really let all the different ingredients complement each other. 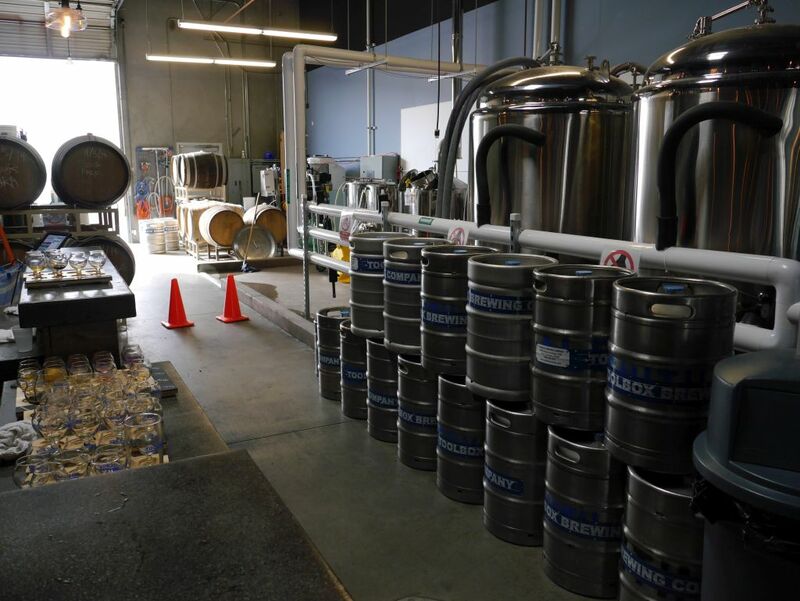 Bagby Brewing Company has a large facility, much larger than you would expect with a newer brewery. A big focus there is on the food, which I didn’t get to try in this visit. 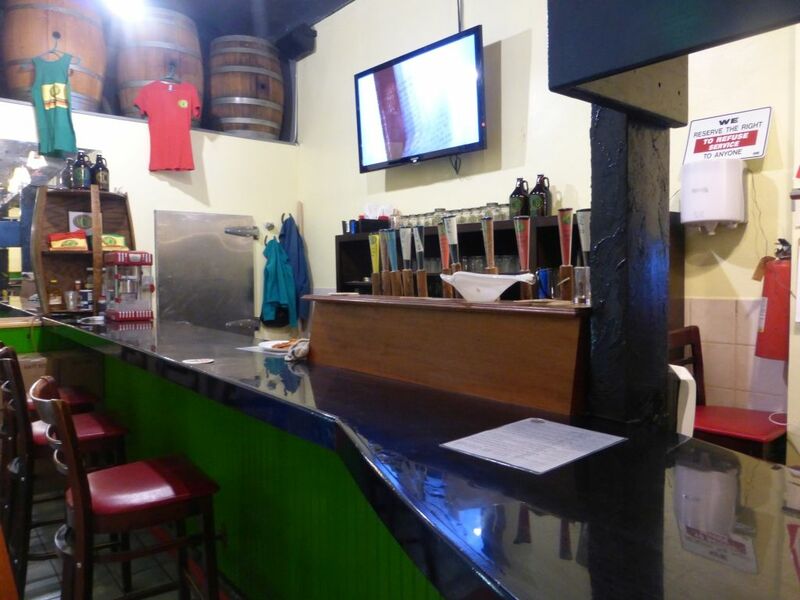 But there are also two large floors with two bars both pouring the full array of beers. Considering the drive up to Oceanside and the number of house beers available it would be difficult to try all the beers in one trip and safely drive back so I only got to taste seven of their beers. However, hopefully at some point I will update this review to include some guest reviews of the rest until I can get back to try what is left. 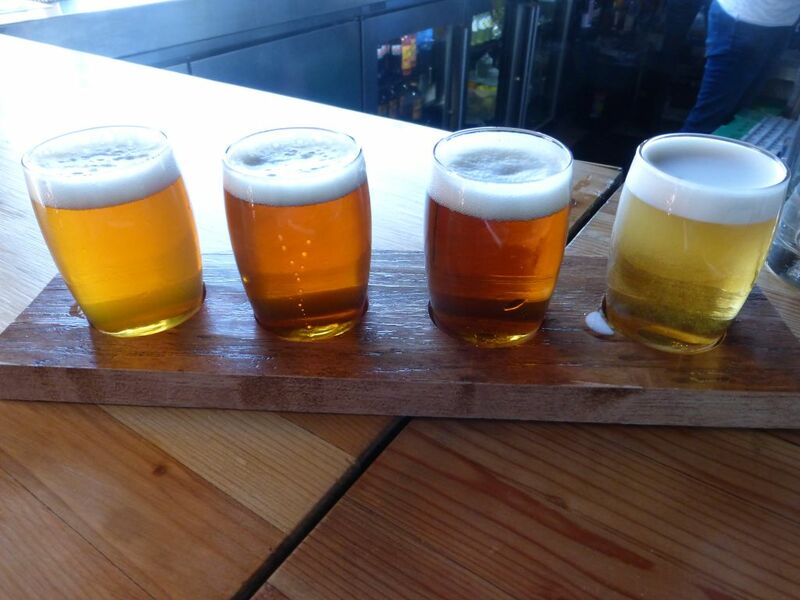 First flight left to right IPA, Strong Pale, Rye Pale, Extra Pale. I started off my time with the wet hop extra pale on nitro. As usual, the nitro really mellowed out the beer so this is not a sipper. Despite the light body, there were some intense pine flavors that were very enjoyable. Next up was the rye pale ale. Rye beers are very difficult to do right and many in this style get the balance of flavors all wrong. Thankfully, this hits all the right notes. It has a solid spicy bite from the rye that balances nicely with mild bitterness and caramel flavors. 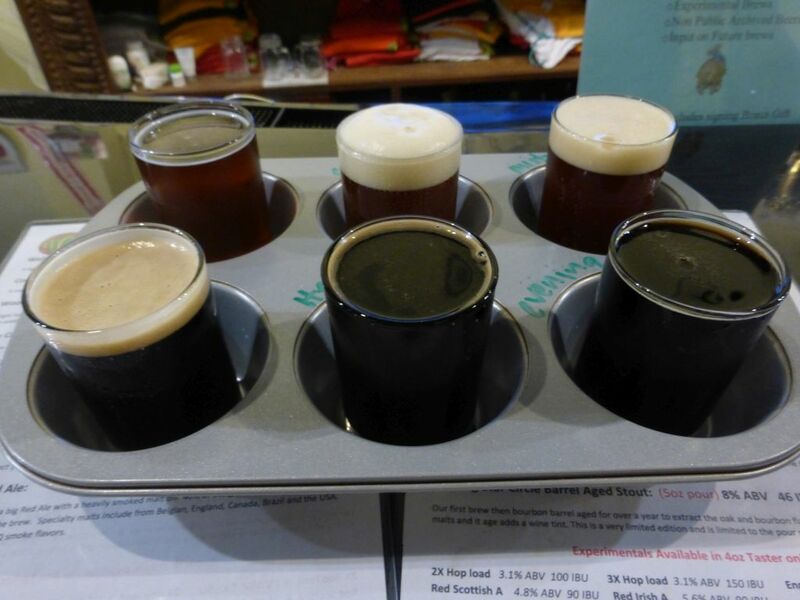 Second flight, left to right Scotch Ale, American Stout, Double IPA. The strong pale is a whopping 6.4% and the higher alcohol adds some additional sweetness to balance out the malts. Hop flavors came through mostly in the way of floral hops. Next I tried the IPA. This is a very powerful beer that manages to bring out all the signature West Coast style grapefruit and citrus while balancing that with caramel malts. This is a great example of how you make a balanced IPA without knocking people over the head with the malts. After the IPA, the double IPA was certainly on the sweet side but it had plenty of tropical fruit flavor, primarily pineapple to balance it out. I had a hard time believing that this was a 10% beer because it really hid the alcohol very well. After the hoppy beers I went on to some of the stronger dark beers. The American Stout is a strong 7.7% and really blended together the flavors nicely. It had plenty of thick caramel and coffee flavors countered by a mild smoky flavor. Finally, I tried the scotch ale, an 8.4% dark beer that packed in tons of flavor. I really enjoyed the mix of dark fruit and nutty coffee for a satisfying beer. 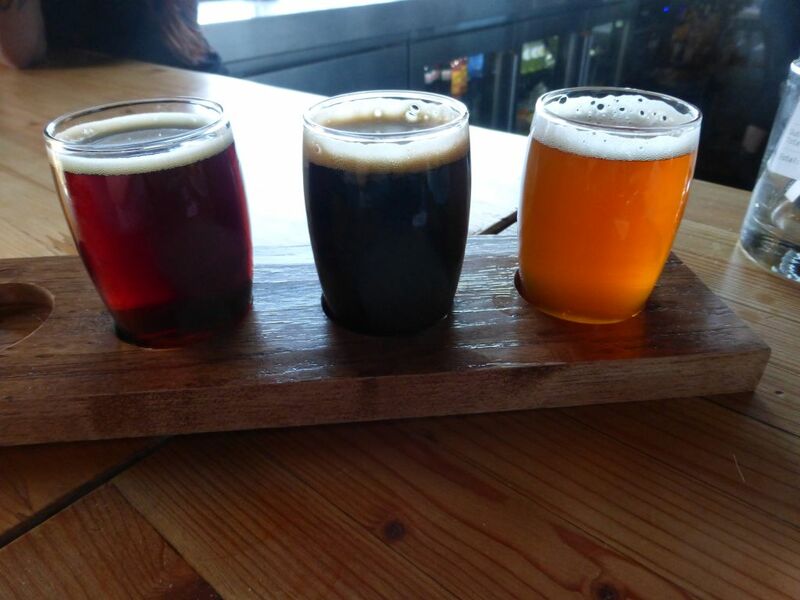 Though most of the beers were very good, I was especially impressed by the rye pale, IPA, and American Stout. I wasn’t the only one enjoying the rye pale as I could hear other people around the bar area talking about how much they enjoyed that one. Though I didn’t get to try any of the food I have heard great things about it. 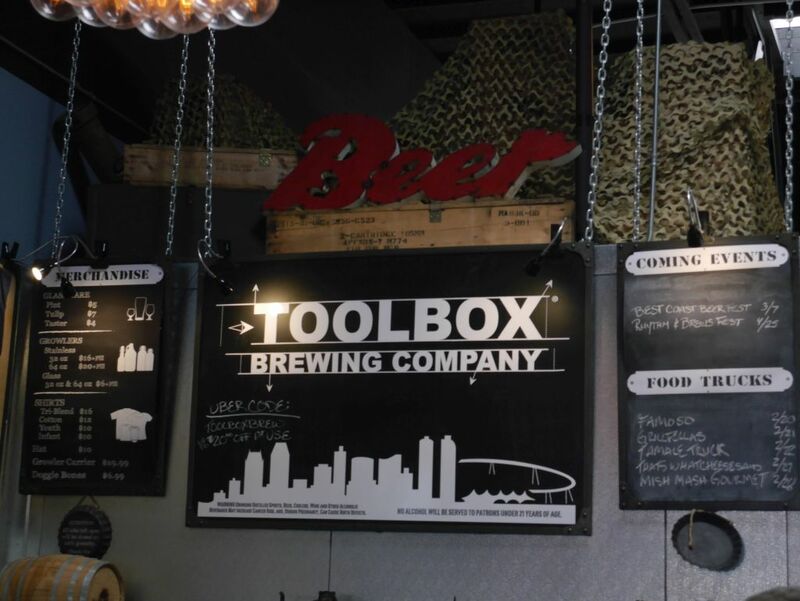 So if you are looking to try out a new brewery, I suggest you make a day of it and visit Bagby for lunch followed by some beer. And if you like to enjoy the sun, there is some outdoor seating available upstairs. Just be careful you don’t let your beers sit in the sun.